Time is our most important posession. You are slowly running out of it, and there's no way to replenish it. Despite this, we will not devote the attention it deserves. This is probably due to a couple of factors. To start with, our brain is not properly equipped to deal with time (I bet you too have felt that one hour is a breeze or takes forever, depending on what you are doing). An then we invest very little in developing techniques to properly manage it. I've been a terrible time manager: I did not have the perspective of what I was spending my time on, I had no control over my own agenda, I felt that I had time for nothing and ended up compromising. Then I decided to tackle this and, while there is still quite some room for improvement, I've made progress. I want to share the tools I've tried, the ones that worked for me and the results I've achieved so far. - Write it down in my phone. Requires way too much willpower and in the middle of a crazy day you just won't do it. Discarded. - RescueTime. Little app that runs on your computer and tracks what applications are active, during how long in your computer. Probably good for someone whose work happens in front of a computer and will probably show interesting Facebook and Twitter habits. Not for me. Too many meetings and things that don't happen on the computer. I was missing a big part of my day. - Dedicated apps in the phone. There are a good number of apps out there (as you'd expect). They are an improved version of the note in the phone I talked first but, while they simplify the process, the problem is still there. I simply forgot to take my phone and register the items. - Paper based form. You will not believe it but this is what made the difference. 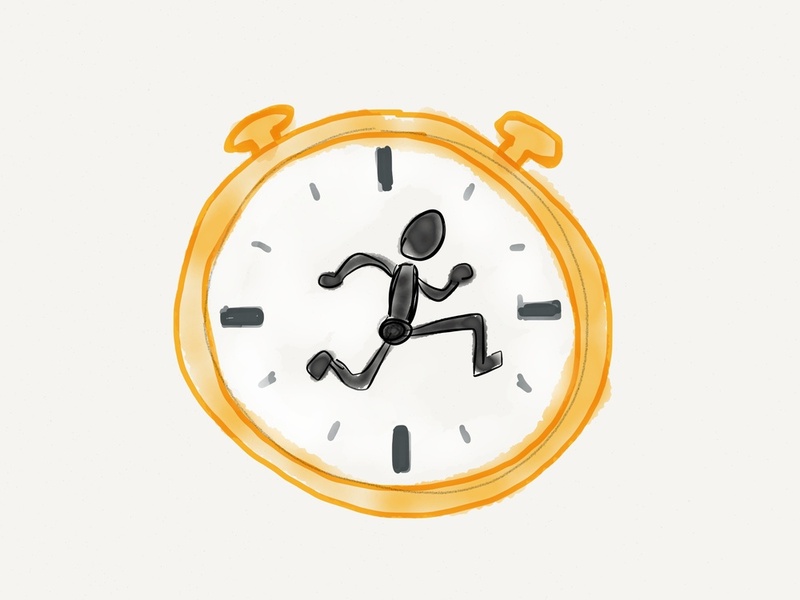 I used the fabulous (and free) Emergent Task Timer by David Seah. The thing is, I printed a bunch of these and every day I took one from the pile, fill the date, and left it on my desktop. The fact that it lied there was reminding me to do it every time I came back to my office. Actually filling it is straightforward and playful. And it made me painfully aware in a very physical way of my time wasters. Highly recommended. - Have a good perspective on how I spent my time: how many meetings, how much time I was producing something meaningful, how many times I was being interrupted, etc. - Identify my main time wasters. - I was arriving work at 9.15h on average. And I've been leaving at 20.30h on average. Those are more than 11 hours spent in the office. Add to this the 1.5 hour commuting, the routines 1.5h (breakfast, shower, dressing, dinner), 7h sleeping, and this leaves just 3h of zombie lifestyle: kissing mi kid goodbye and collapse in the coach. This is what I would actually call an inconvenient truth. - I found 3 key time wasters. First one, meetings. I had an average of 6 meetings a day. Despite the general belief that meetings are unnecessary and a big waste of time, I have to admit that I could find a reason for all of them. But having 6 everyday seemed just way too much. - Second, meetings that do not finish on time. I started to be painfully aware that, if I didn´t have another meeting schedule back to back, I tended to over run with unproductive stuff: either repeating over and over again the same things that have already been discussed or simply engaging in small talk. - Third, people running into my office to simply "chat". People with some spare time that decide that I'm the right guy to have a nice time with before their next meeting. I love to be that kind of guy for people, but now I realize that not at the expense of being a zombie for my family. - Finally, it was simply impressive the number of interruptions I faced on a daily basis. I estimated that I could hardly spend 15/20 minutes before someone run into my office or I receive a phone call. So the bottom line is: I was spending 11h at the office, enslaving myself into a lifestyle that is depressing to say the least, just to let other people dictate what THEY want to do with MY time (which is my most important posession, not to forget), by putting things in my agenda that I didn't dare to say no to, or interrupting me anytime they want, and then decompressing through small talk in the office at the expense of my energy and my family. (Quite a timely post precisely when a new app promises to target most of the problems mentioned above. I'm talking about Timeful. Pretty interested in testing it out. I'll keep you posted. In the meantime, take this quiz to check your time management score.